Ah Rome, the eternal city. City of love and art, history and fashion. Home to the Parthenon and the Pasta Museum! Hang on - the Pasta Museum? Yes, in Rome you’ll find the world’s only Pasta Museum. In it, as well as the history of pasta making - there is documented evidence that it was being made as long ago as the twelfth century – there are exhibits that explore the link between pasta and art, including a series of paintings by contemporary artists. So, you’ll be in good company when you and your kids sit down with a packet of pasta, some paper and some paint.Toddlers will enjoy pasta painting in its simplest form: let them loose with a variety of pasta shapes, some saucers of paint mixed with some child-friendly glue, brushes and a large sheet of paper. Sugar paper is useful for this: you can buy it in large toy shops and stationers. For older kids who’d like a bit more of a challenge we’ve some other suggestions. Drain and rinse it under cold water. Spread a thin layer of glue over a sheet of paper. When the pasta’s cool enough to handle, give a handful to each child and encourage them to make face shapes on the paper. Cut the spaghetti into short lengths to make hair: curl it, make a pony-tail or plaits. Use other cut and shaped pieces to make the face features. Adding food colouring to the water when boiling the pasta will give you different shades, or use specialist green (spinach), red (tomato) or black (squid ink) pasta. Use different shape pasta for even more versatility. Design stick people, cars, dinosaurs, etc: your child is limited only by her imagination. To keep the picture, cover it with greaseproof paper and leave a heavy book on top of it for a while. This will keep the pasta stuck to the page. Speaking of dinosaurs, your young palaeontologists may like to make some dinosaur fossils. Put some pasta tubes into a bag and break them up by banging with a rolling pin. Remind the kids to watch their fingers if they’re doing the crushing, and also remind them that the bits of broken pasta will be sharp. You don’t want the pieces to be too small but they should be suitably bone-like. Add a spoonful of glue to a handful of potting compost and hand-mix it, adding more glue as necessary until the soil sticks together. Flatten it out onto a foil-lined tray. Add the pieces of ‘dinosaur bone’ until you have what looks like a skeleton. (Find a picture in a book or on the internet to give you something to work towards.) Press the pieces in firmly, coat the whole creation with PVA glue (that dries clear), and leave to dry. Paint the pasta and leave it to dry. While it's wet, sprinkle with glitter for a sparkly finish. Brightly-coloured thick paint will have the best result. Measure a length of ribbon that will fit over your child’s head or hand, not forgetting to allow for a knot at the end.When the paint is dry, thread the tubes onto the ribbon. If you have different length tubes, try alternating them as well as mixing up the colours. When the length of ribbon is almost full, knot the two ends together. Alternatively use bow-shaped pasta and tie at intervals along the ribbon. (You'll need to start off with a slightly longer piece of ribbon for this.) Of course, you could mix tubes and bows! 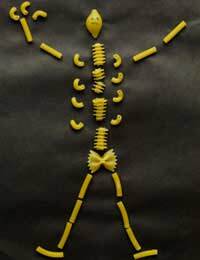 For the brooch, glue different shaped pieces of pasta onto the dough base, and coat with PVA glue for a shiny finish. You can buy spray adhesive with which you could coat the jewellery to stop the paint flaking off but that’s definitely not a job for a child! An adult needs to do it, outside preferably as the fumes are pretty strong.